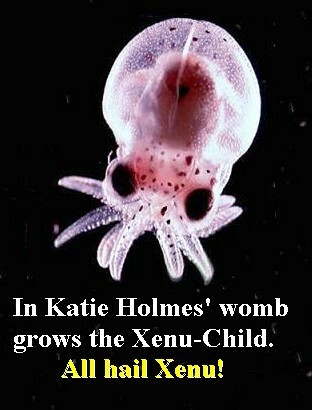 As we all know, Katie Holmes is preggo with Tom Cruises’ child. But who is this Xenu character? In Scientology doctrine, Xenu (also Xemu) is a galactic ruler (of the “Galactic Confederacy”) who, 75 million years ago, brought billions of people to Earth, stacked them around volcanoes and blew them up with hydrogen bombs. Their souls then clustered together and stuck to the bodies of the living, and continue to cause problems today.